Albion firemen soak down debris from a shed fire at the Ken and Donna Iwan farm Monday afternoon, April 23. Albion Fire and Rescue responded to the incident quickly. There were eight units and 15 personnel at the scene. Fire Chief Bruce Benne said the call came in a few minutes before 3 p.m. and the crew got to the fire around 3:10 p.m. Benne said the responders were at the site until 4 p.m. 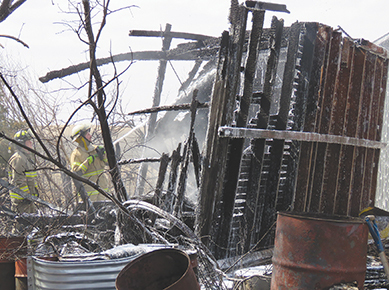 It is suspected that embers from a cornhusk fire a few days previous were swept up in the wind and ignited near the family’s storage shed. Iwan said the family actually planned to tear down the shed this summer.